It all starts with a simple cheek swab that collects each dog’s unique DNA in the Springs Clubhouse. The pet owner will swab their own pet and give it to a Springs team member, who packages it and sends it on to the lab. Once they’ve collected this initial DNA sample, each pup is then given a registration number and tag, and their information is entered into the BioPet World Pet Registry. With your pet’s DNA information on record, anytime a member of our Springs team sees a pile of poop on the ground all they have to do is collect a small sample of the waste and send it to BioPet Pet Labs. There, scientists run a DNA test and cross-reference the results with their DNA database before sending the results back to us. Once we’ve discovered who the culprit was, the offending resident will be fined and reminded to pick up after their pets. Because the cleanliness of our grounds is so important to us, the fines start at $200. While we wish we didn’t have to remind residents to pick up after their pets, the PooPrints service impels those who might be inclined to “forget” to pick up that it is in their best interest to be responsible. We have found that we don’t levy that many fines, and it does lead to a cleaner community for pet-owning residents and non-pet owners alike. We’re happy to offer our leash-free, fenced pet playground and pet spa areas for all residents to use, but no one wants to worry about stepping in dog poop while they enjoy them. There are rarely any multiple offenders with the PooPrints service, allowing Springs to create a dog poop-free environment – and that’s something we can all support. 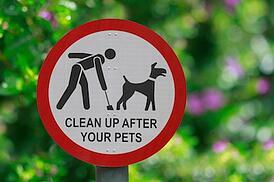 For more information about our community pet policy please click here.